In a bid to save his little institution from economic ruin, Darrell Smith, the superintendent of the WACO Community School in the village of Crawfordsville, Iowa, found inspiration in a surprising source: hog farmers. With classrooms across Iowa suffering from budget cuts, Smith needed to get creative to save money. 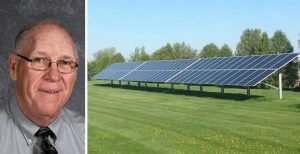 After seeing how hog and turkey farmers cut costs on local farms by using solar energy, he decided to try the same model in his school. And lo and behold, it worked. Big time. 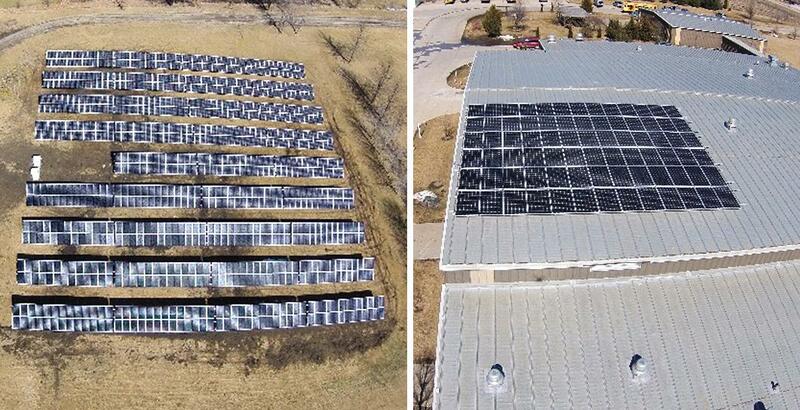 Solar panels have cut electric costs by 90 percent since January 2015, allowing the school to stay open. This raises untold possibilities for all manner of enterprise, and is therefore potentially significant. Specifically, this offers educational institutions a model for how renewable energy can help them save money — while educating students on how alternative energy sources work. “We’re a small school, we have 500 students K-12,” Superintendent Smith toldWhoWhatWhy. We mostly rely on enrollment fees to support the school, but we had declining enrollment and our expenses don’t go down.” Negotiated contracts with the teacher’s unions meant that it was impossible to cut staff costs. And school officials certainly didn’t want to fire any of their teachers. So we looked at the farmers as an example. They use solar energy as a[n] energy source, and solar energy allowed us to cut our spending. 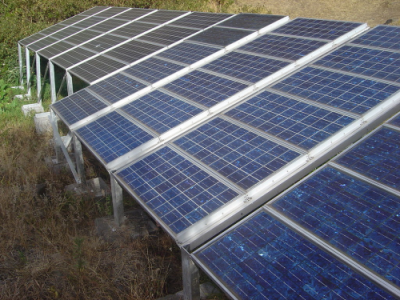 Just how did solar panels keep the school district from economic ruin? In Iowa, schools receive a separate allotment of the state’s six percent sales tax—but the allotment can only be used for infrastructure. Infrastructure includes long-term investments for buildings, athletic facilities, computer systems, and the like but does not include day-to-day operation costs that keep the school open, such as paying teachers … or the electric bill. In this case, WACO invested $1.2 million in solar panels, and is using its allotment from the sales tax to effectively pay back that investment in infrastructure. 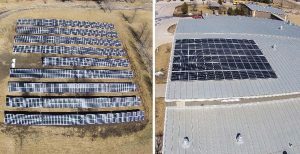 The solar panels produce power for free, which defrays those electricity costs that previously were paid for out of their general operating budget. How effective has the solar initiative actually been? On a sunny day in May, Smith says, the school was able to produce over 110% of its electrical needs. And because they have an agreement with the electric company that allows them to use leftover solar energy to offset the energy provided by the company, the school can still reap the benefits of the solar energy scheme on a rainy day. Schools everywhere have no choice but to get creative. In Iowa, one funding source after another has dried up over the years, prompting a wave of school closings and district reshuffling. Between 1965 and 2013, 117 school district reorganizations have taken place, according to the Sioux City Journal. According to the Des Moines Register, in 2014 alone, 29 Iowa schools were shuttered, and 65 districts received notices that they were in danger of deficit spending, And last year’s first school session began with even more children crammed into even fewer schools. “You don’t have to travel very far in Iowa to find towns that have been decimated — that you can trace back to right about the time the school shut down,” Tim Gilson, an assistant professor of education at the University of Northern Iowa who studies the effects of school consolidations in Iowa, told the Sioux City Journal. To residents with long memories, this budgetary pinch may seem un-Iowan. In the early years of the 20th century, Iowa was in the vanguard of “the high school movement,” offering secondary schooling to qualified students throughout the state. 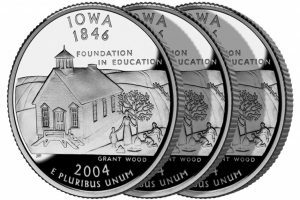 With the third highest high school graduation rate in the country, Iowa proudly highlighted education on its commemorative quarter in 2004, the only state to do so. Iowa is the only state to highlight education on its commemorative quarter. Now, those eager to return to better days are approaching Smith for advice. Though with each district comes different funding sources, so it would not be easy to replicate what he did. And despite the savings, the WACO school can just balance its budget and maintain existing programs. Nonetheless, the gambit worked–and it has been an educational experience for all—literally. Teachers and students get to see exactly how much solar energy is needed to make a computer work. An elementary level class monitors how much energy the school is producing — and how much fossil fuel they are not burning. This, Smith notes, allows young people to grasp the impact they are having on the environment. “In education, we have to get creative sometimes,” shrugs the quintessentially understated Iowan, who has given “Pork Barrel” politics a whole new meaning.